The health, culture and community connections of the Squaxin Island Tribe are threatened by the declining quality of the natural environment, according to a recent study. The multi-year, community-based study included dozens of interviews and workshops with Squaxin tribal members. Washington Sea Grant and the Squaxin Island Tribe conducted the research together. “We feel a close connection between our physical health and the health of natural resources,” said Aleta Poste, the tribe’s traditional garden director, who helped conduct the research. The study began five years ago as an exploration of how the tribe’s sense of place and identity are connected to shellfish. “We sat down with tribal members and had frank discussions about the changes they’re seeing and what those could mean to the tribe,” said Melissa Poe, a social scientist with Washington Sea Grant. While the researchers found that the act of shellfish gathering was still vital to individual tribal members, they also realized that the ongoing degradation of the natural environment was putting shellfish at risk. That is when the researchers decided to broaden their view at look at what damage to natural resources was doing to the tribe’s well-being. “We wanted to figure out what a healthy life and well-being meant for a Squaxin Island tribal member,” Poe said. While the results were just recently published, the conversations over five years inspired tribal members to take action. The most tangible result of the study was the tribe’s traditional garden program, launched a few years ago. The program now includes a garden that provides food to the elders’ lunch program, as well as a traditional plants garden, an orchard, and a classroom facility. In addition to the garden, the tribe’s natural resources department works to expand tribal members’ access to shellfish and salmon. The Squaxin Island Tribe is enhancing beaches throughout deep South Sound with funding from a 2007 agreement between treaty tribes and private shellfish growers. More than 30 percent of the nearly 1,100 Squaxin Island tribal members are active shellfish harvesters. “It doesn’t take a lot of money to get out on the beach and dig clams, just some time and a fork,” said Andy Whitener, the tribe’s natural resources director. In the last decade, the tribe has planted tens of millions of juvenile shellfish, leading to the harvest of more than 1 million pounds of clams from enhanced beaches. The tribe has been actively protecting and restoring salmon habitat throughout their treaty-protected area. Coho salmon, an important species to tribal fishermen, have been on a regional decline for the past few decades. The tribe releases more than 2 million hatchery coho each year to provide for harvest, and they’re also engaged in habitat restoration aimed at naturally spawning coho. The tribe has worked to remove a dam, build logjams and restore the estuary on Goldsborough Creek. They have also had a hand in protecting and restoring habitat on several other small creeks. “We’ve seen coho begin to turn around on Goldsborough, which shows us that we can pull salmon back from the brink if we work hard enough,” Whitener said. 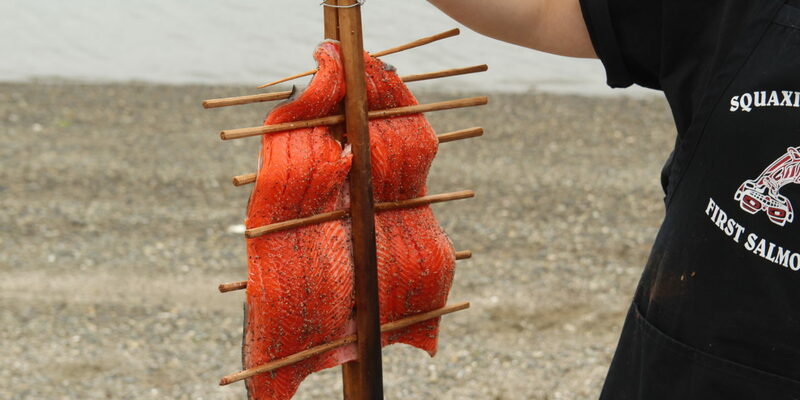 Chinook salmon being prepared at the Squaxin Island Tribe’s First Salmon Ceremony in August, 2018. Photo: E. O’Connell.